If you saw my post yesterday then you know how much I love LOVE this creepy psychological thriller. My jam, my butter, my toast, my everything. 👐 I've repeated my review at the bottom of this post so you can read it again - and then go buy it. NOW. Releasing tomorrow, if you are a fan of thrillers, this is a must read. Jessica, my partner for #allthebookreviews completely agrees. 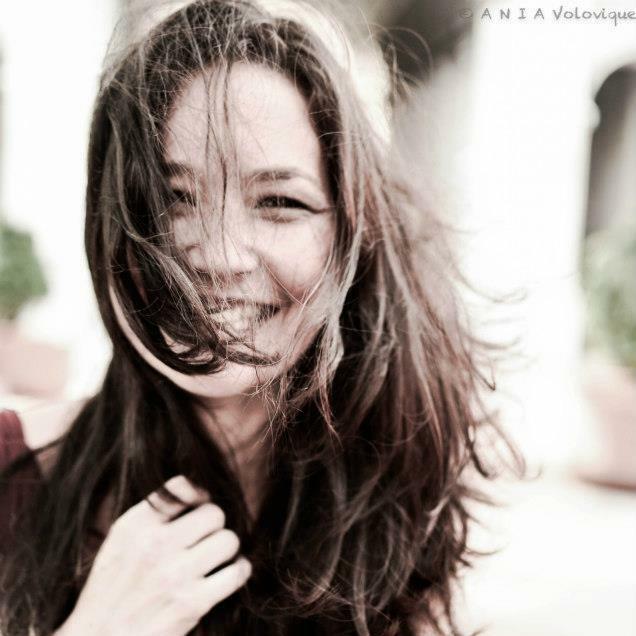 Scroll below and see what she has to say as well - we are in full agreement for this punch-you-in-the-face book! The eye catching cover paired with the description, "Se7en meets The Silence of the Lambs" - there's no way I wasn't going to read this book. 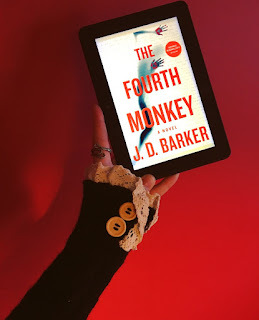 My first novel by JD Barker, THE FOURTH MONKEY was quite the way to start with his work. Dark, twisty, and gruesome - this is the perfect thriller for any horror and suspense fans out there. Detective Sam Porter is woken up by a phone call - there's been an accident and he needs to come to the scene. Considering he works in homicide, Porter is confused but amuses his partner and goes. A man was hit by a bus, but this wasn't just any man, they believe that he is the Four Monkey Killer. The 4MK is a serial killer that had terrorized the Chicago area for half a decade and was never caught. He followed a very specific formula, and with the body, Porter finds a white box wrapped with a black string. He has another victim, another victim that could still be alive. Not only do they find the package on his person, but they also recover a personal diary from the killer. Since his face was mangled in the bus crash, they still have no idea who he is. Porter takes the diary with him as they fight to find the next victim. You dive into the mind of a psychopathic killer. Through his diary he continues to taunt the detectives while giving very minimal clues as to who he has taken. I loved this book. So twisted, gory, and fast paced. We go through alternating narrators in this story. The diary entries are my favorite - I found myself reading faster so I could get to those chapters! I really liked how the killer got his name. Not going to lie, when I saw the title I was thinking, "how the hell does someone get that as their nickname?" The whole, Hear No Evil, See No Evil, Speak No Evil monkeys come into play. 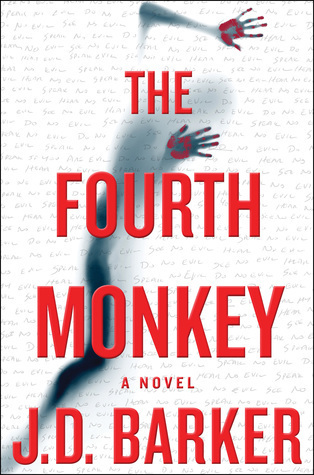 He would first send an ear, then the eyes, the tongue, and then the body would be found with a note that read, Do No Evil (the Fourth Monkey). This was my first time reading anything by JD Barker, and it definitely will not be my last! I love his style of writing. The short chapters made this read even faster. It was the perfect amount of twisted and demented for a serial killer thriller. Porter and his partner Nash were incredibly likable. Porter's backstory was effortlessly weaved into the story, which made his character seem even more human. If you like the thrillers where you dive into the mind of the killer and that isn't too heavy on the typical police procedural, then I'd highly recommend this one! I give this 5/5 stars! 5 full ears, eyes and tongues! The Four Monkey Killer (4MK) has been stumping law enforcement for five years. A body is found, carrying a small white box which holds the ear of a young girl (a 4MK calling card) and Sam Porter, taking time off to deal with his own inner demons, is drawn back in as lead on the case. It appears that even from the grave, 4MK has put into place a game to leave his final message. Clues are everywhere. A diary is found on the body and Sam is taken deep into 4MK's childhood, just one of many carrots dangling in front of his proverbial horse. Can Sam solve the clues before another person has to die? WHAT A FREAKIN' RIDE!!! Barker takes us on quite the psychological journey. Alternating between Porter (lead detective on the case), Claire (another detective), Emory (the abducted girl) and 4MK's diary, he leads us right into the bowels of torture hell... and I love every single minute of it! I was mostly enthralled with 4MK's diary - we get a birds eye view right into how he became molded to be the person that he is - what can I say, I love a twisted mind. Reading this was like having 2 books in one - WIN WIN! The way Sam Porter pieces together clue after clue is exciting and I felt right in the middle of the chase. While some parts may not be for the squeamish, the author does it in a way that feels necessary and not for shock value. I definitely felt myself cringing at certain areas, but wide eyed and ready for more. There is also much humor in the banter between the characters that I truly appreciated and helped to alleviate from the somber, more disturbing parts of the story. Huge thanks to HMHBooks for these copies in return for our honest reviews!